Deborah Roberts, Mary J. Blige, Ray Halbritter, Marcia Gay Harden and scholarship recipients attend the HELP USA 2010 Domestic Violence Graduate Scholarship awards luncheon hosted by by Marcia Gay Harden and Deborah Roberts, honoring Mary J. Blige at Four Seasons Restaurant on November 9, 2010 in New York City. 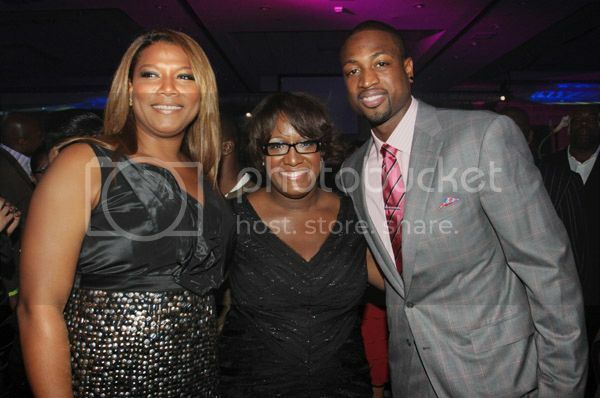 Actress Queen Latifah, Tiffany R. Warren and NBA star Dwyane Wade attend the 2010 ADCOLOR Awards at Fontainebleau Miami Beach on November 7, 2010 in Miami Beach, Florida. The annual event serves to promote increased diversity in the advertising, marketing and media industries and inspire current and future communications professionals of color by celebrating the accomplishments of diverse role models and industry leaders. A special congratulations to Kim Hunter, Founder and Chairman of the LAGRANT Foundation (previously featured HERE) as the recipient of the Change Agent Award. 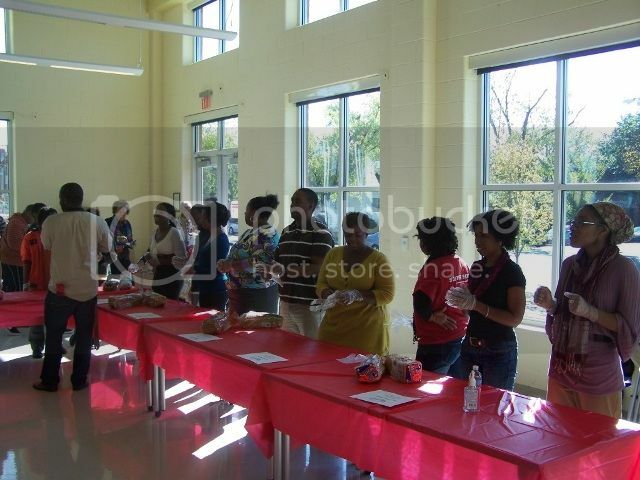 Volunteers line up to prepare sandwiches for distribution for Martha’s Table mobile soup kitchen during the Northern Virginia Urban League’s National Day of Empowerment, October 30, 2010. Volunteers with the Northern Virginia Urban League (NOVAUL) did their part in supporting the Inaugural National Day of Empowerment on October 30, 2010. The new initiative was supported nationally by the National Urban League Young Professionals, National Council of Urban League Guilds and YUM ! Brands in a fight to end world hunger through volunteerism and education. “This is a great way to get involved in the fight against world hunger,” said Kristen Herring, a member of NOVAUL’s Young Professionals Network (YPN), as she placed a slice of cheese onto two pieces of turkey meat. YPN members, who range in ages from 21-40, were joined by the NOVAUL Guild Auxiliary, whose members are 40 and over. High school-aged volunteers from NOVAUL’s N.U.L.I.T.E.S. youth development program were also in attendance. YPN urges the community to join them in volunteering at the Fannie Mae Help the Homeless Walk on November 20, 2010 in Washington D.C. For more information on this walk and other YPN activities, please visit http://www.nvulypn.org/. 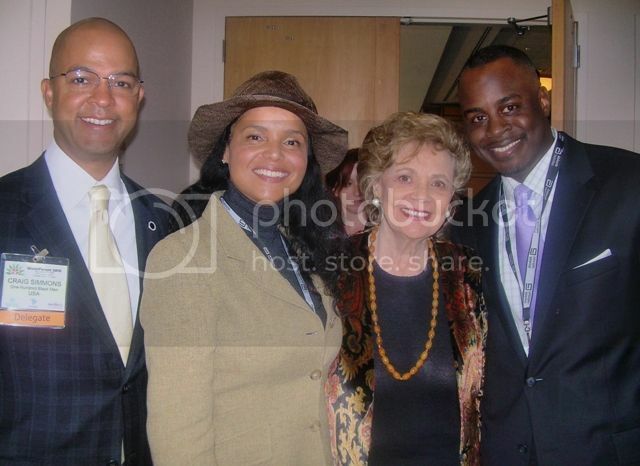 Craig Simmons, Executive Director, 100 Black Men of New York, Inc.; Victoria Rowell, Actress, Author and Humanitarian; Matilda Cuomo, Founder /Chair of Mentoring USA; Stephen Powell, Executive Director of Mentoring USA, at the 21st annual International Forum for Child Welfare conference on November 8-11, 2010 in Palisades, NY. International delegates and child welfare experts gathered at the IBM Learning Center in Palisades, New York, November 8-11th for WorldForum 2010, the 21st annual summit of the International Forum for Child Welfare (IFCW)—an international nongovernmental organization dedicated to the promotion of the rights and well-being of children globally that recognizes the contribution of effective leadership in the challenge of making the world a better place for children. Alongside the IFCW, co-hosts for this year’s summit were the Committee for Hispanic Children and Families (CHCF), Mentoring USA and Mentoring USA/Italia. Featured speakers included Bryan Samuels, Commissioner, United States Department of Health and Human Services, Administration on Children, Youth and Families; Victoria Rowell, New York Times Bestselling Author, Actress and Humanitarian; Cheryl Perera, Founder and President, OneChild, Canada; Dr. Djibril Diallo, Senior Advisor to the Joint United Nations Programme on HIV/AIDS (UNAIDS); and Efren Penaflorida, Founder of the Dynamic Teen Company, and CNN Hero of the Year, Philippines. For more information on future World Forum conferences, please visit http://www.ifcw.org/ or http://www.worldforum2010.org.